The Netherlands just joined the race to the bottom in corporate tax. Repeating the mantra that lower tax is good for the investment climate and necessary to remain competitive, the new government cheerfully leaked that it will reduce the rate from 25% to 21%. The facts show that corporate taxes are irrelevant for a country’s competitiveness. Surprisingly, current tax rates on profits, or indeed the higher rates from a decade ago, do not matter at all. The graph shows the top 50 countries in the Global Competitiveness Index. This index is constructed by the World Economic Forum, where there’s no lack of insight about what makes an economy competitive. The countries are shown by their Internet codes, for example DE is Germany and CH is Switzerland. The higher a position of a country in the graph, the higher the competitiveness score. The horizontal axis shows the total corporate tax rate, from zero-tax Bahrein on the left to a 40% average rate for the US on the right. The truth is that there is no need for any country to copy the misguided policy choices of its neighbours. It is in a country’s own interest to refuse joining the race to the bottom on corporate tax, and instead focus on those competitiveness factors that really matter. Occasionally those factors may include taxes. Far more often, they do not. I might add, the UK should take note. NB: Linked with permission from Francis. The evidence is clear. Taxes can be screwed up to the max for everyone (it can always be given back to those in need through credits later if needed), revenue won’t be affected and everyone (*) will be better off. I know this is your campaign and it needs to be shouted louder. (*) everyone that counts that is. OK then – go for the counterfactuals. – 99% tax rate on income. How does that play into the Laffer Curve? My instinct is that 99% of zero is zero. – 99% tax rate on corporate income in one country, when all other countries impose a tax rate of less than 99% (and presuming that there is full country-by-country reporting across all countries in the world so that there is no income shifting)…? And a bit of ‘on the ground’ evidence with regard to ‘people not moving’. People that have previously been able to shift their income illegally, or legally, and are now less able to, are now physically moving to Singapore, Hong Kong, Jersey, Switzerland, and other low tax countries. For people, it is the number of days per year residency rule that is becoming more important than before. And to change that number will take even more international co-operation than has been achieved in recent times since the late 1990s. Tax co-operation is thriving. Tax competition is too. And if you’re mad enough to think that there will be a coordinated global corporate tax rate or a coordinated global income tax rate, then the Laffer Curve is the best tool out there to guide you away from your folly. C) I was mad enough to think that tax co-operation was possible and helped create the environment for it to happen, and some of the tools. I am sure it will go further. And I am wise enough to know you are wrong. And how will that make the poorer members of society, or middle earners, or any earners feel, other than those not receiving credits? ‘We’re taxing everyone to the hilt – but don’t worry, we’ll give you tax credits’? Sometimes the politics of tax, and politics in general, is missed completely from these sort of armchair comments. You seem to be expressing exasperation born, I suspect from imbibing mainstream media ‘Tax-is-Bad’ propaganda. – nobody moves due to tax (and those that do can just be taxed on exit) Apparently Americans are reluctant to move relatively small distances across state borders in their own country to take advantage of local tax differences. Let alone emigrate to a different country. The majority (99%+) of US passport holders are taxed on their worldwide income. It doesn’t matter where they live in the world. (Although it is a bit of a grey area for U.S. astronauts visiting the International Space Station). I like the astronaut line. Very few discussions don’t benefit from an injection of humour. Company law recognises (strangely perhaps) companies as having a discrete identity. They are regarded in some legal contexts as ‘persons’. These ‘corporate persons’ don’t exactly have passports yet they roam, apparently freely, across international borders and ‘live’ where they wish. Payment of taxes appears to be largely optional for them. One of the issues that Donald Trump is hoping to address (and I have little expectation that he will be successful) is the repatriation (specifically to the US) of taxable wealth from these vast corporate players. His current outline suggestions are acknowledged by Warren Buffet and others (not your archetypal apologists for the left !) as to be likely to yield great benefit to corporate interests and shareholders in an already badly dysfunctional market place without doing much, if anything to promote productive investment. The solutions to this issue of globalised taxation for a globalised economy are not going to come easily. One thing, though, is for sure: without addressing the problem there will never be a solution and that in the longer term won’t benefit anyone The likes of Warren Buffet rely on a properly functional market of productive assets for his clients to invest in and profit from. Actual levels of taxation high or low expressed as percentages are irrelevant. Certainly not worth becoming exercised about if the whole system doesn’t work. Unless I’m missing Richard’s point completely this is the gist of his observations (graphically illustrated) at the head of this post. Sissons and Brown have been here in 2011 with their analysis of the tax perks offered by Enterprise Zones. The tax levels themselves are neutral in outcome, but what makes such schemes successful was something else entirely which was the liberalisation of planning. Time to stick the Green Belt and the NPPF on to a North Korean rocket then. As has been said already – illuminating. My view has been for a long time that the issue of taxation in our political economy has just been used to help politicians to get votes. It is a political construct but not one based in reality and it seems to have come from the strongly libertarian strain found in the USA. What is worse is that the value of taxation as a concept had been almost removed from society – that is until Richard and others started to stick up for it again and remind us about things that we had been made to forget. God bless you all I say – xxxxx. What we have had since 2010 pulls everything sharply into focus. Money has been taken out of the economy which has reduced taxes and the redistributive routes of this money such as the benefit system has also been deliberately undermined. And what do we have? Money that could have been collected as tax especially from say the top 5 % is now sitting there doing nothing except being invested in assets (also causing those assets to be overpriced and having a gravitational inflationary effects on other services and commodities ) or being used as debt pools to those who are suffering wage or social support reductions! The rich have been left untaxed basically but that does not mean that they buy more toilet roll, pizza or washing up liquid than anyone else. Yet buying toilet roll, pizza or washing up liquid are things that others may find difficulty buying these days. The point is that money has been taken out of the real economy – all those everyday transactions that make the economy what it is and as Paul Krugman has said ‘everyone’s wages is someone else’s wages’ (and someone else’s tax too). A Government that seems to be unable and unwilling to look after its people (the same people who contribute to the country’s wealth with their labour and spending decisions and whom would be called upon to defend it to the death it if the need arose ) – especially its most vulnerable. Sorry about the rant but honestly…………………as American economist Richard Wolff says in one of his lectures ‘Can’t we do better than this?’. Thanks for that . Very interesting indeed. It also serves to confirm my suspicion that the race to the bottom on corporate tax is nothing more than evidence of corporate lobbying, influence peddling and the general corruption of political representatives. There is a whole myriad of issues going on here. They can be summarised in two ways: first, collecting domestically earned income versus collecting foreign earned income, and second, whether there is a level international playing field for the collection of foreign earned income. The above chart does not differentiate between the two. 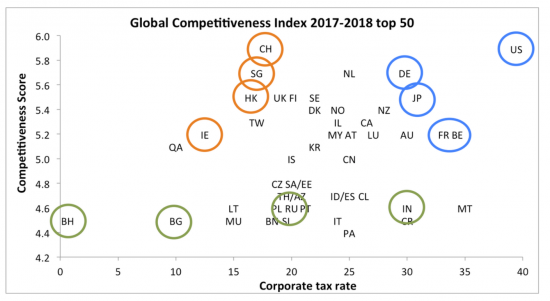 Which is why you have allegedly high tax economies (U.S.) and allegedly low tax economies (CH) coming out highly in the competitiveness chart. International tax cooperation is on the second issue: the extent of a level playing field for the collection of foreign earned income. For people, it is harder in 2017 to evade or avoid taxes than it was in 1997. And this has absolutely nothing to do with country-by-country reporting. Bringing the Laffer curve back in – is why some people ARE starting to physically move. If these people can’t evade, or avoid their taxes by shifting their income, then they can physically move. And that’s tax competition in an environment of intergovernmental tax cooperation. For companies, it is different. First, the US plays a huge role. Why? Because the US is the largest power in the world and because the US taxes worldwide income. Do you think Apple or Amazon are going to pay their alleged historic tax avoidances to Ireland and Luxembourg?!! Highly unlikely. It is the start of a negotiation which involve the U.S. government and the E.U. Commission – (as a side-note the E.U. side could be played in the U.K.’s favour as either a stick or a carrot in the BREXIT negotiations as the U.K. has historically been a pro- advocate for a level international corporate tax playing field – under both Tory and Labour. It was the Tories who helped to kick start international tax co-operation in the mid 1990s.). Second, back to the initial point on the Laffer Curve: in a world where income (for people) and profits (for corporations) are attributed in exactly the right place – a world of nil avoidance and evasion – then competition on the tax rate matters! Which is why the Laffer Curve is important and has importance. To sum up: greater international co-operation to eliminate tax evasion and avoidance will result in greater competition on tax rates. And to restate what I said earlier: if you think that every country in the world is going to agree to the same corporate tax rate, or even a minimal one, or if you think that people will accept a high rate of taxation – presuming there is no avoidance or evasion by those better off than them – then the Laffer Curve is a good tool to guide you away from your folly! Apart from the fact you’re trolling with false emails – and so will not get on again as this is just irritating – your logic does not stack. I very much doubt enough people are moving for it to be statistically, or in real economic terms, significant. And I say that even taking into account formula 1 drivers and the occasional yacht dwelling tycoon (or should I say pirate of the high seas?). Living in NL I hear occasional stories of people upping sticks and moving across the border to Germany or Belgium to save on taxes, but these are people living pretty close to the border already. In most cases I doubt they are moving further than say, Oxford to London. Very interesting. I thought Bojo said we need to emulate Romania last week? To me it is fairly obvious to make a country appealing to investors there are a number of factors that an investor would want to take into consideration. iii) Infrastructure – is there necessary supporting technical, transport, logistical and social infrastructure? iv) Skills and recruitment – are there well skilled, well suited staff available locally? v) Quality of life – can our staff live reasonably happy lives there or is it going to be insecure or unpleasant. Will our directors want to live there? I’m sure taxation is on the list but that it’s by far not the most important factor. It’s no use having a 0% tax rate if there is no supporting infrastructure, poorly trained staff, and poor logistics to move your product around. Whereas if you have all of those in place, with a low level of risk, then you can be more certain about your rate of return. Of the two, I would imagine that a low level of risk would be far preferable to investors than a low level of taxation.